The Kim’s Game of a spiritual (#1) and sporting (#2) nature was elaborated for anyone who is waiting in public buildings, such as hotels, airports, bus terminals, shopping centres and hospitals. It can be played alone or as a family in order to pass the time and ease loneliness. 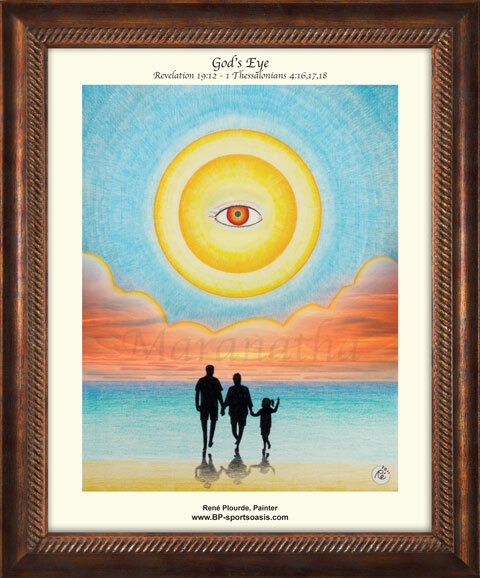 This game consists of finding the first model of the colour drawing entitled “God’s Eye”, later on, with the same brown frame, the three paintings as well as six scrolls on exhibition in the participating establishments. The objective is to develop your observation and memory skills by looking at them and reading them. You can take notes as you walk around in order to successfully pass the test. When you finish the game, buy your souvenir certificate for $25. This will give you access to the game questions, which you can answer in order to get the results on your certificate, and be eligible to the annual draw. 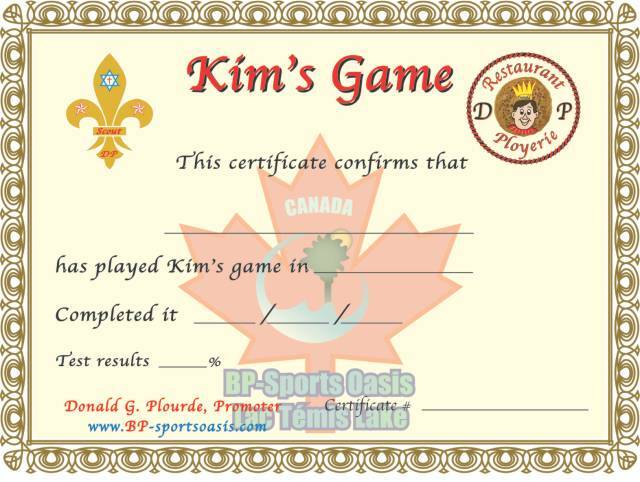 The cost of Kim’s Game Certificate ($25) at BP Sports Oasis Palace will be shared as follows: $5 to the collection exhibitor afiliated with Kim's game concept, $10 go to Scout Palace Inc.; $10 go to the drawing (from all Kim’s Game sales), which is always held. This drawing will be held during the Dégelis Western Festival in 2015. Anyone wishing to purchase the paintings or scrolls, with the official frame used for Kim’s game, may do so on the website, under Store. Also, you are invited to participate in the Town Tour excursion with Kim’s game (outdoor game) in order to discover the history of the town visited. To date, the Town Tour excursions for Rivière-du-Loup, Edmundston and Grand-Falls are ready.